A few of the friends I met at the Do Life event were running in a 5k race on Thursday, and I wanted to be there and support them, but I couldn't afford to run it myself. So, I volunteered to help out. It was really interesting being on the other side of a race - I was a course marshal. 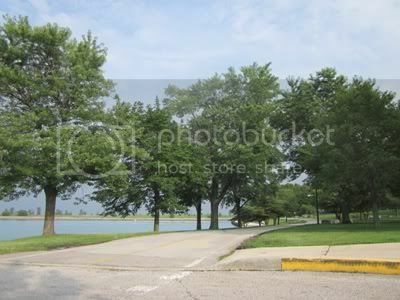 The race took place along the lakefront running/biking path, just south of Soldier Field. I don't bring my camera when I run down there, so I took advantage of having it with me this time. Absolutely lovely. When I run the path, I start way up north where you can hardly see the city. As I run, it all gets closer: first I can see the John Hancock building, then I run past Navy Pier, and I end up across from either Millennium Park or Buckingham Fountain, depending on how long my run is. As my runs get longer, they'll get even more scenic: past the aquarium and natural history museum, past Soldier Field, and into personally uncharted territory. Explore the edges. Dip your toe in the bold, the outrageous, and the unthinkable. Seek out and have adventures. I knew the goal before I read the explanation, and I was nervous about it. Could I possibly be more afraid than I am right now? I'm already pretty scared these days. I'm scared about not being able to pay my rent or my bills. I'm scared about the uncertain future for my family situations. And I'm really scared about weight maintenance, something I realized recently and will expand upon later this week. I think this goal isn't so much about becoming afraid in a anxious/fearful/terrified sense as it is about pushing yourself into the unknown, challenging yourself, and discovering your limits. As a generally cautious person, I don't usually step out of my comfort zone and do things that are "scary," in a spontaneous and unplanned sense. I'm not sure of the source, but there's a quote that says if you're not living on the edge, you're taking up too much space. I like certainty and organization, and these things are not found "on the edge" - they're safely a few feet away, behind a guard rail. So, I'm still trying to figure this one out, to be honest. Today is the first day of August, and I'm stepping into the scariest, most challenging month of my life, and not just on my weight loss journey. There's a lot to figure out between now and September, and I'm a nervous wreck - but I'm facing it, head-on. I've made a sub-goal to do two "scary" things this week - and I'll report back next Monday. Chocolate mud masque! It smells delicious enough to be fun - but it smells artificial enough to not trigger anything. Like chocolate scented markers, kind of. How are you finding your goals this challenge? Do you still think you can achieve them? Love them - they're honestly a challenge for me, and I like taking a little time each week to sit down and think about my non-scale progress. Freebie! If you want to change one goal, change it. Explain your decision even if you don't change any. My goals are sort of non-traditional and all go together, so I'm keeping them all! If you could live anywhere in the world where would it be? Your funds are unlimited! I'd stay in Chicago - I love it here so much. Though, maybe I'd get a fancier apartment, one with more space for books and a window with a built in seat that I could curl up on and read. But since I'd have unlimited funds, I'd also have a vacation home in the French countryside, of course. Chocolate mud masque sounds dreamy! That masque does sound dreamy. The idea of scaring yourself is pretty intriguing as well. I'm definitely the organized type person; though I will say that the greatest risks I've taken have yielded the most rewards. Best of luck on your August! I really like Chicago. I need to visit when the weather isn't as cold & crappy when I visited a couple of years ago in February. It was a shock to this California girl. I have never been to Chicago before, I'll have to add it to the list of spots to check out at some point! That mud mask sounds lovely too! I was thinking of getting one of Ben's Do Life t-shirts...but it is like wearing a concert T shirt to a concert you do not attend. Since I am not a runner...and do not see it in my future unless I surprise everyone. I was wondering if there is a specialty T-Shirt that I may get that makes the world know that I am on a better my life through weight loss journey without having to say so? I see below the word meatloaf so I must go check it out! I like your goal to scare yourself. Pushing ourselves to do things we find uncomfortable, scary, etc. is how we grow. Besides, we may find the experience so enjoyable we continue with a new favourite thing!